Mix rub and let it sit while cutting the meat. Butterflying any type of meat is a technique that can be quickly mastered. Just remember to keep the roast uniform if trimming fat, and to cut between ½ and ¼ inch thick. Check out this youtube video for a demonstration. Trussing is pretty easy after a little practice. The important thing to remember’s that you don’t want to strangle the meat (it’ll need to expand during cooking). Check out this youtube video for a demonstration. Preheat oven to 350°F. Heat oil at medium in a deep skillet or dutch oven. Season the outside of the pork with salt and pepper and brown the loin, turning 4 times to get complete coverage. This should take about 20 minutes. Add the milk, mushrooms and shallot. You can also add more pepper if you like things spicier. Bring to a simmer, cover and then move to the oven for 30 minutes (enough time for a meat thermometer to register 155°F). Turn the loin after 15 minutes. 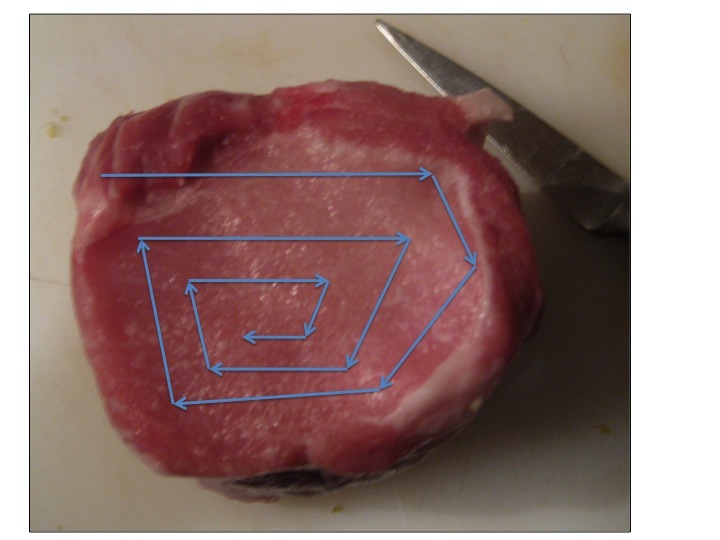 Move the pork to a cutting surface. Bring cooking liquid to a boil, add chicken stock land lemon juice, stirring continuously to break up the curdled milk. You can also add a tsp or two of dijon mustard. Reduce liquid to a gravy and place in a serving bowl. Cut the twine from the loin and serve. Pairings: Like any good comfort food this should be served with mashed potatoes and a green salad. If time permits & you have the energy to steam some vegetables, try carrots or green beans. A fruity white (late season or a riesling) will go well.